Neither shows anything significant for sure in the next week, thus our totally dry 7 Day forecast. They all look pretty much the same. I should point out some models have the ridge backing a little farther to the west, allowing a chilly trough with showers to set up somewhere around the 10th day. We’ll see how that pans out. No matter the details, the weather pattern looks real nice for early June with no hot weather but no period of cool showers either…enjoy. 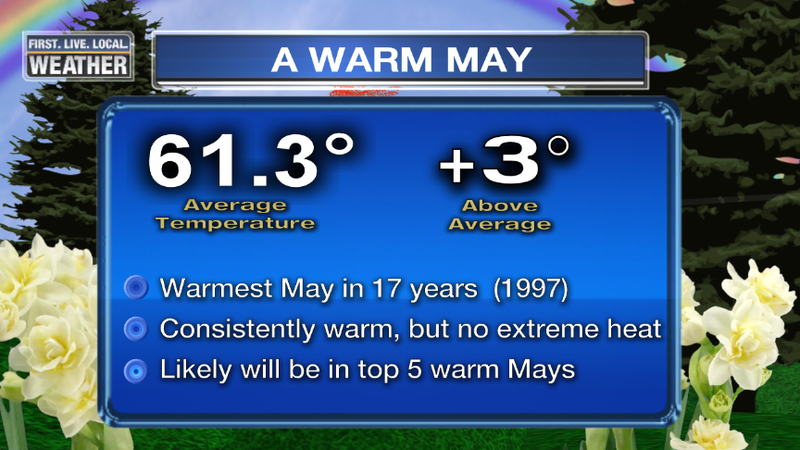 It sure hasn’t been a “hot” May, but it has been consistently warm. And have you noticed what else is different? 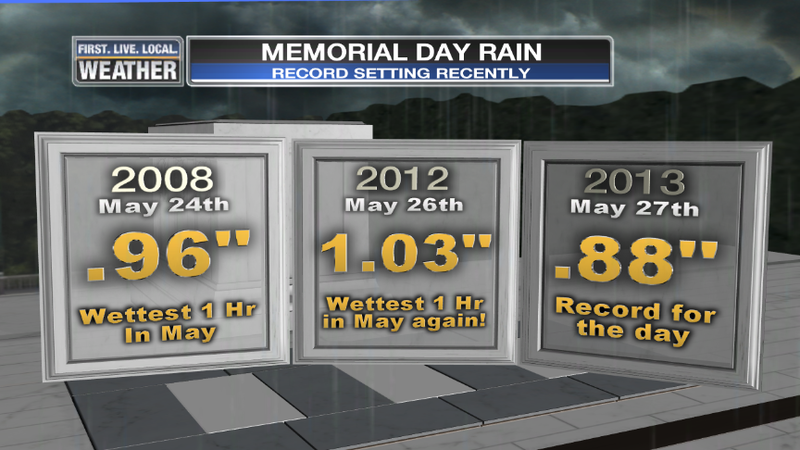 We haven’t had any long period of cool and wet weather! Rainfall is running about average for northwest Oregon and southwest Washington, but the severe drought continues across southern Oregon and California. Earlier tonight I calculated the monthly average temp with the numbers so far and then added in the forecast highs/lows for the next 3 days. It appears that the average temperature will remain about 3 degrees above average here in Portland. That’ll give us the warmest May in 17 years! As mentioned, we’ve sure seen hotter weather in May, but most years that is then followed or preceded by cool/showery weather. By the way, there’s a very good chance the much warmer than normal northeast Pacific waters are at least somewhat to “blame”. 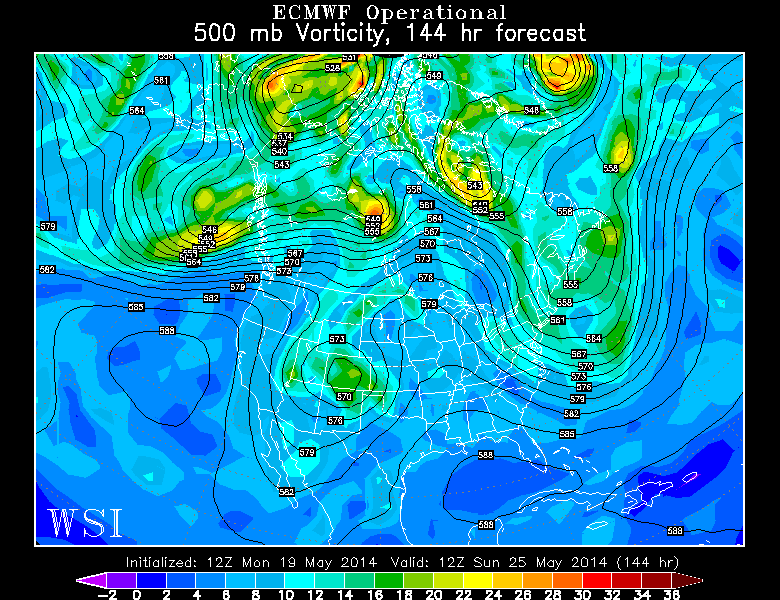 That along with a lack of chilly westerly upper-level flow too. 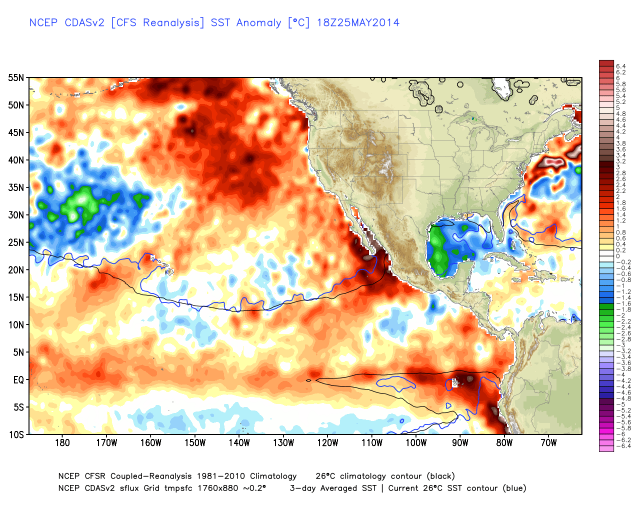 Check out the huge warm pool from the coastline all the way out into the central Pacific. 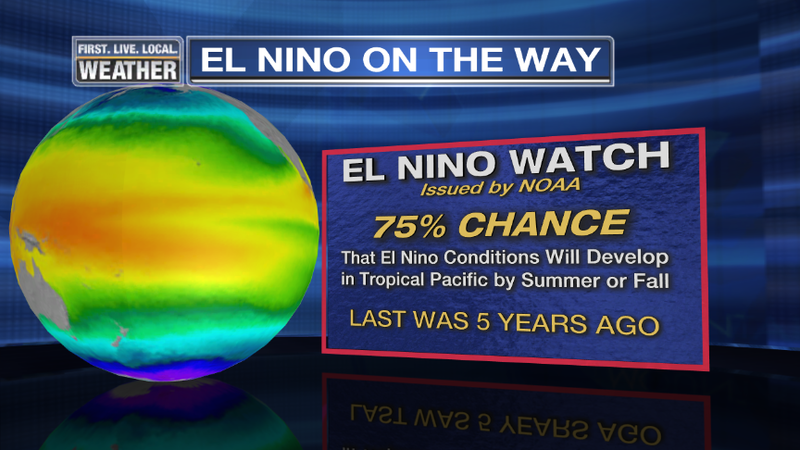 It has been there for at least 6 months and probably isn’t going anywhere with El Nino developing to the south. Another reason we will likely see warmer than average temps this summer, along with the data we’re seeing elsewhere referenced in a posting last week. We will remain in weak upper-level troughing over the next 5-7 days, so we won’t be cloud-free and we won’t see decent offshore flow to push temps well into the 80s. But temps will return to a few degrees above average (70s) starting Friday and continuing through most of next week. I just got back from shopping at a very large boxy store (TONS of diaper wipes and toilet paper now) and all they were talking about was the changeable weather today. As the one worker said…shorts one minute to umbrella and jacket the next. The most intense storm of the day, at least according to the radar, belongs to a strong cell that moved southeast through Clark County. Take a look at the radar image showing 66 dbZ echoes right over SR 503 in the Brush Prairie area…did it rain hard there??? I think so. You can see how the heaviest rain avoided most of the official airport locations…Only Troutdale got close to 1/2″, although more is on the way there in the next 1/2 hour. 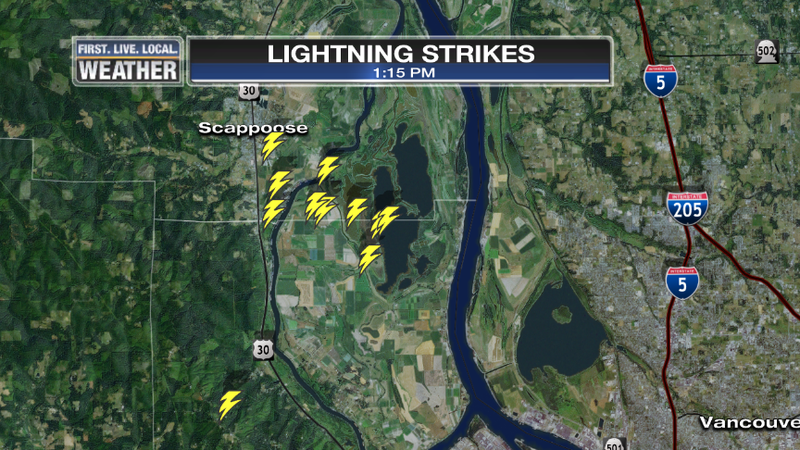 Scappoose and northern Sauvie Island just got pounded with 11 lightning strikes the past hour as a strong thunderstorm moved through. Probably a bunch of hail too! As expected, a real active midday today as the chilly upper level trough is moving overhead. We’re actually on the backside of it this afternoon so theoretically the action should die down. But we’re also headed into the peak heating of the day, so through 5-6pm just about anyone could sail hail or thunder. As of 2pm there haven’t been any other lightning strikes detected by the system we use (WSI). 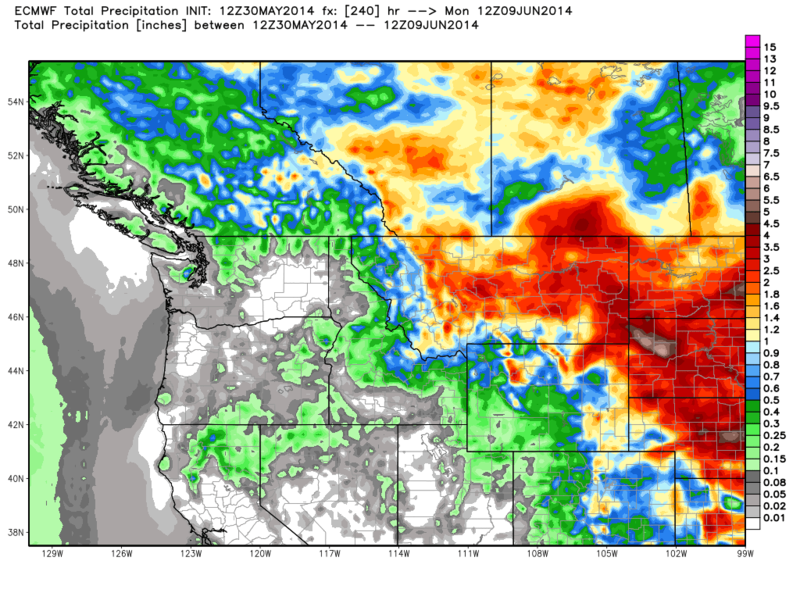 Enjoy the rain and hope your garden gets a good soaking because I see little or no rain in the next 7-10 days. Here is the ECMWF meteogram showing the mild and dry weather after today, although I think it’s a little on the warm side for parts of next week. 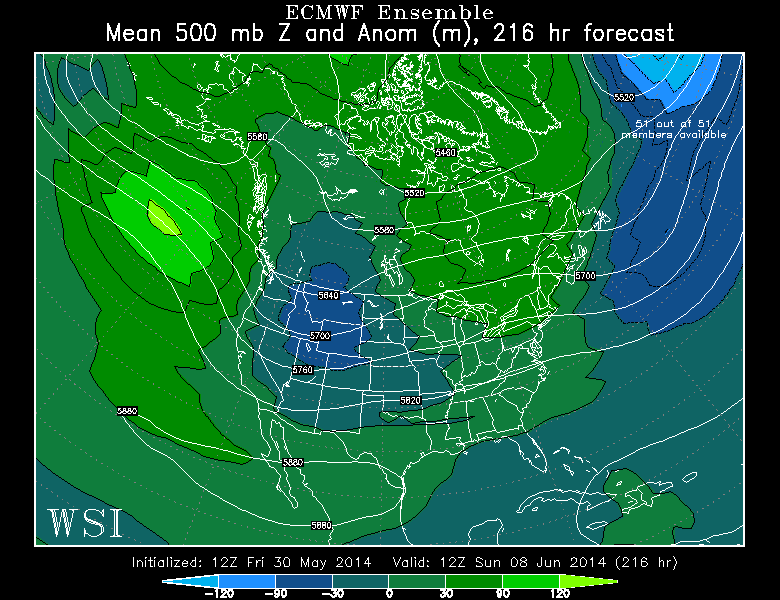 In general the weather pattern remains quite slow and not real exciting the next week or so. But tomorrow and Wednesday a cool upper-level trough will edge closer and then right over us, destabilizing the atmosphere. That leads to afternoon showers both days, especially Wednesday. This weekend ended up a bit drier than I expected. We sure expected the mainly/all dry Saturday and Sunday, but then the system yesterday evening and overnight was weaker than anticipated. 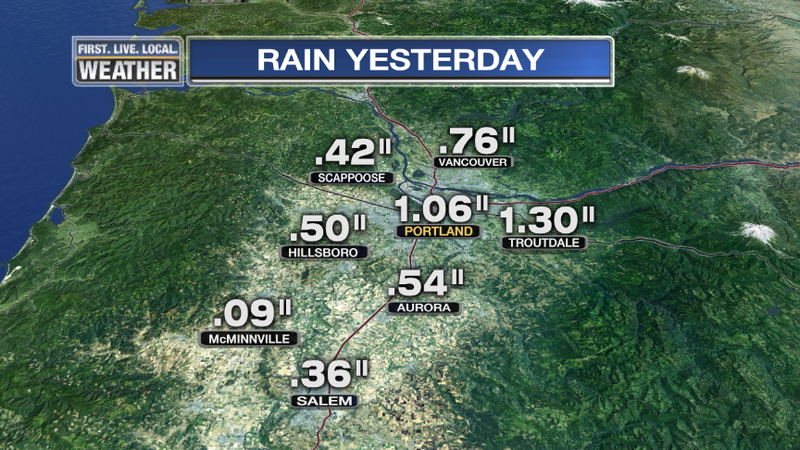 As a result; weekend rain totals were pathetic. 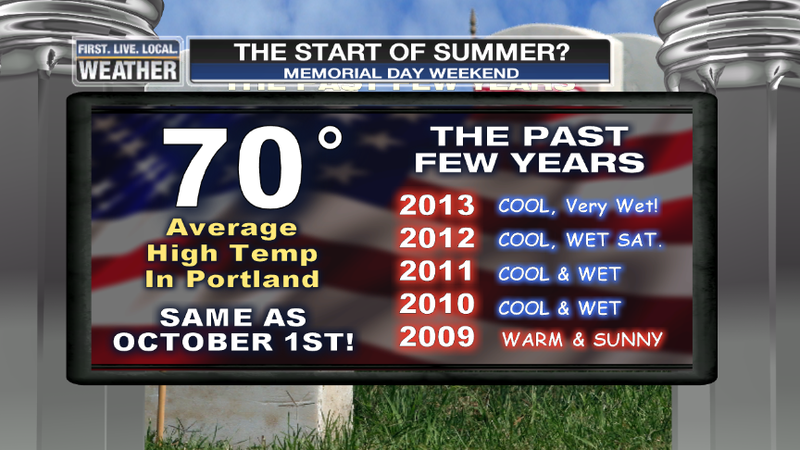 So I’d say this Memorial Weekend was the nicest in 5 years…since 2009. Back by popular demand…actually there is no demand for it…is the graphic showing our average high temp in late May is similar to late September or early October. So even though meteorological summer is right around the corner (June), it’s hard to call late May the start of summer here. This year though it sure wasn’t bad was it? and 5pm when the showers are moving out over the valleys. Lifted Index values and CAPE also suggest thunder is possible, although probably the “rumble here and there” variety, not the exciting stuff. So the message is to get your dry weather activities done before early afternoon tomorrow! Is It Going to Be A Hot Summer? Most years I don’t get many questions/emails along the lines of “what will the summer will be like?”. 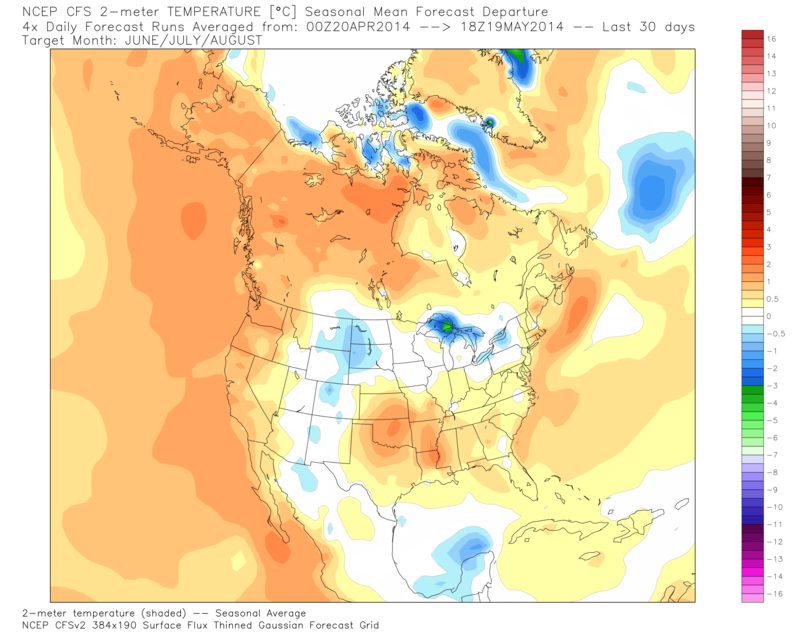 For sure each summer’s approaching weather doesn’t generate the interest I see as we approach each winter. But this year I’ve had a few people ask, so I took a look. Even I was a bit surprised by the result. I think we all know that IN GENERAL when we have that warming of the tropical waters we tend to see the jet stream develop much farther south in the wintertime. California tends to have stormy/wet winters and we tend to be a bit milder and definitely drier than normal in those winters. But what about summer? 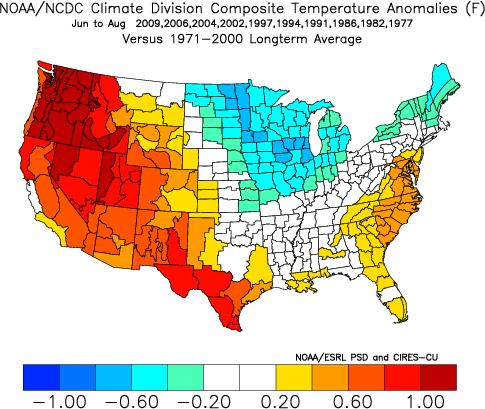 I went back and looked up the last 10 episodes in which an El Nino was developing over the summer and compared it with our summer weather that year. The years are 1977, 1982, 1986, 1991, 1994, 1997, 2002, 2004, 2006, 2009. Some of those were weak El Ninos, two were strong, and a few were moderate. Then I ran those years through a nifty tool on the NCDC website. 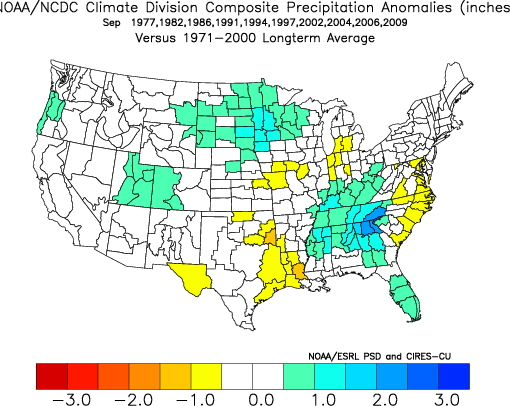 You can plot temperature/precipitation anomalies for any year or group of years. They are all basically the same. How about 90 degree and 80 degree days? Both are tallied below. Blue is below average and Red is above In this case Portland’s 90 degree average is 10-13 (we average more now than we used to) . Same thing with some real hot summers in there. But notice a significant minority did not see extreme heat. 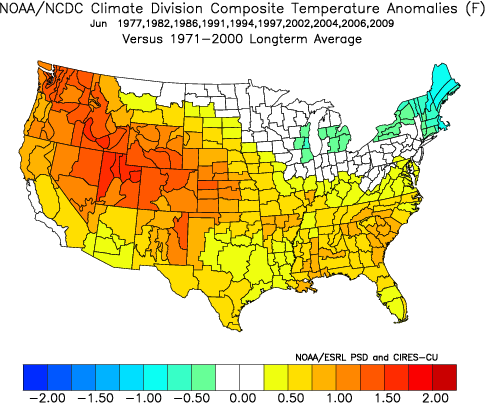 So an El Nino summer does not guarantee an unusually high number of hot days. 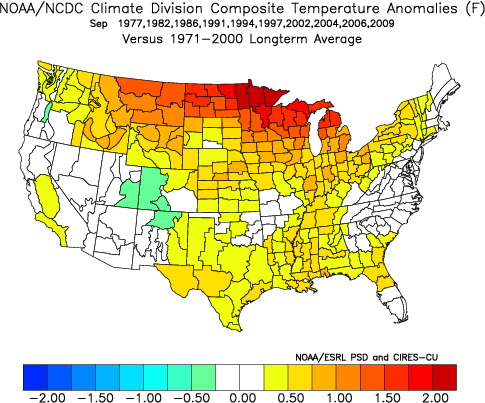 Most interesting to me is that none of the last 10 El Nino summers have been cooler than average; none were “chilly”. Again, this is no indication of a scorching hot summer. That will depend on whether we get several episodes of strong upper level ridging sitting directly overhead which kills the mild onshore flow. the warm pool has been there since at least early winter, probably leading to several episodes of ridging to our west. This isn’t likely to change through the summer. 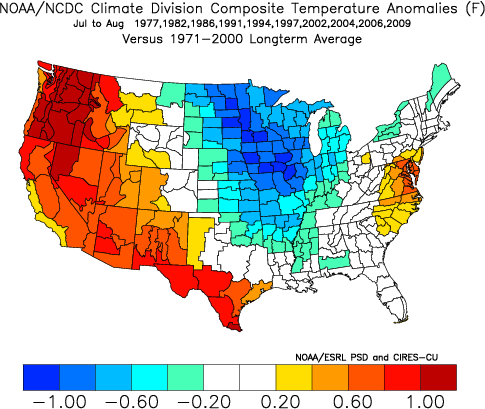 I’d say the odds are tilted away from a cooler than average summer west of the Cascades. More likely we’ll see a normal to above average summer; good news if you have trouble growing tomatoes or cantaloupes. Bad news if you don’t have air conditioning; hopefully when it does get hot it’ll be a dry heat. We’ve got an easy forecast for the next 3-4 days…lots of sunshine and warmer than average temperatures. Enjoy the nice workweek again! 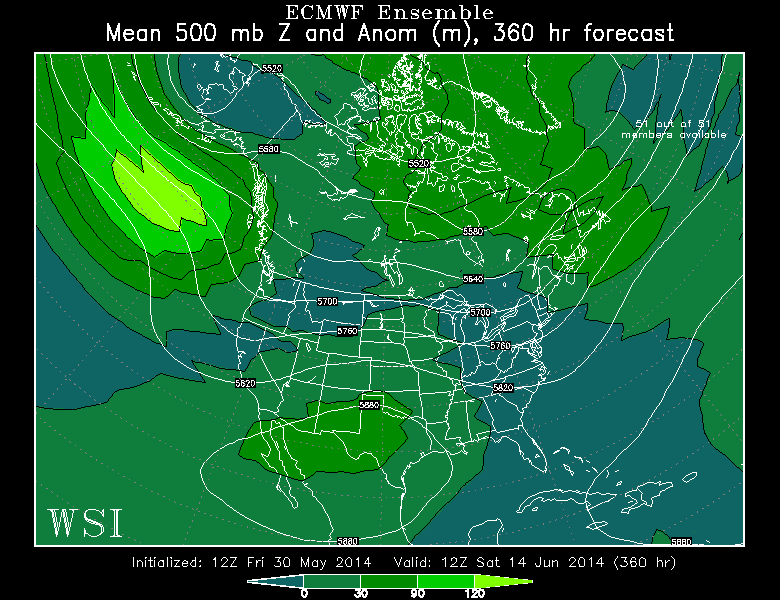 Quite a soaker for some us on Sunday as the cold upper-level trough moved through. Some areas saw thunderstorms with downpours and even hail. 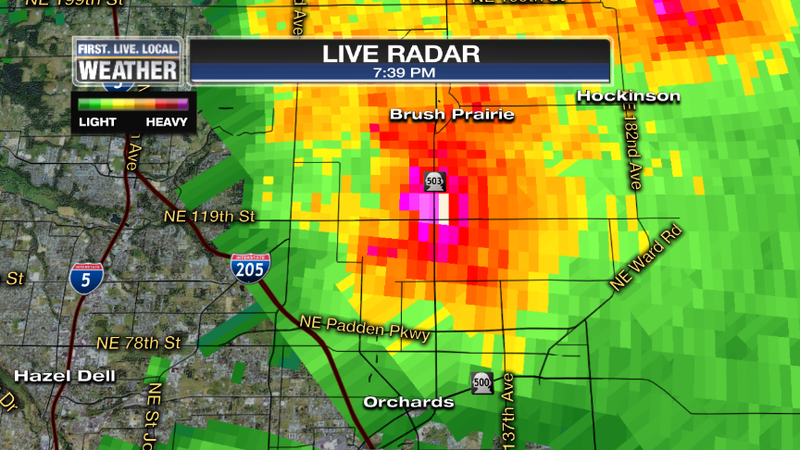 It appears the middle and eastside of the metro area got the biggest soaking. 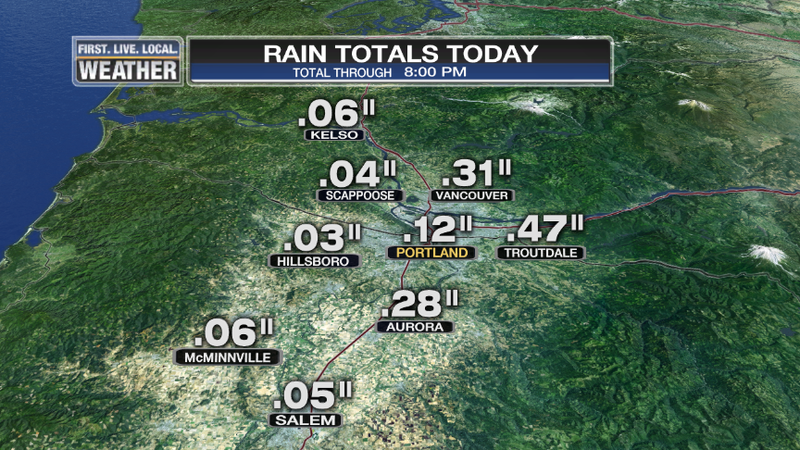 Portland’s total was a record for the day, and the wettest day since early March. That’s heading away from us now, replaced by a weak ridge of high pressure that peaks over us on Thursday. Here’s the issue with the 4-7 day part of the forecast; another cool upper-level trough approaches the Pacific Northwest this weekend. 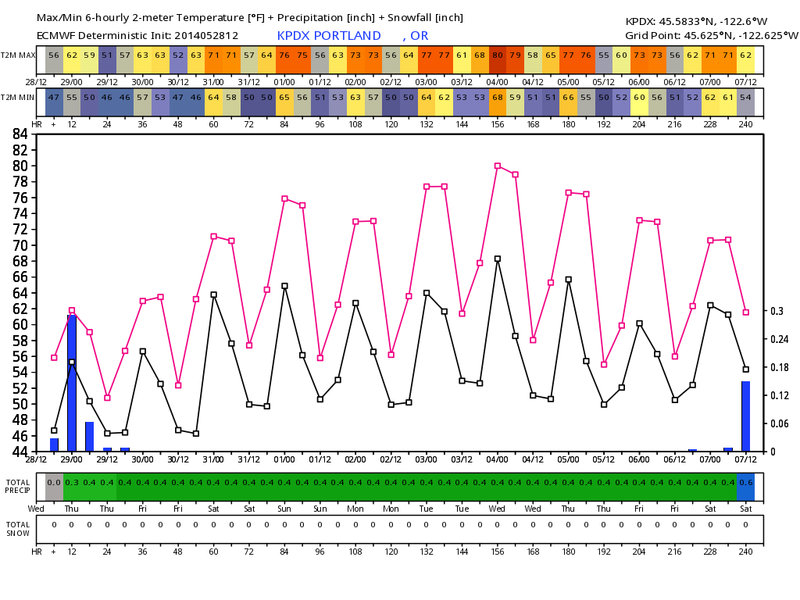 So in general the weather appears to head downhill from Friday through Monday. 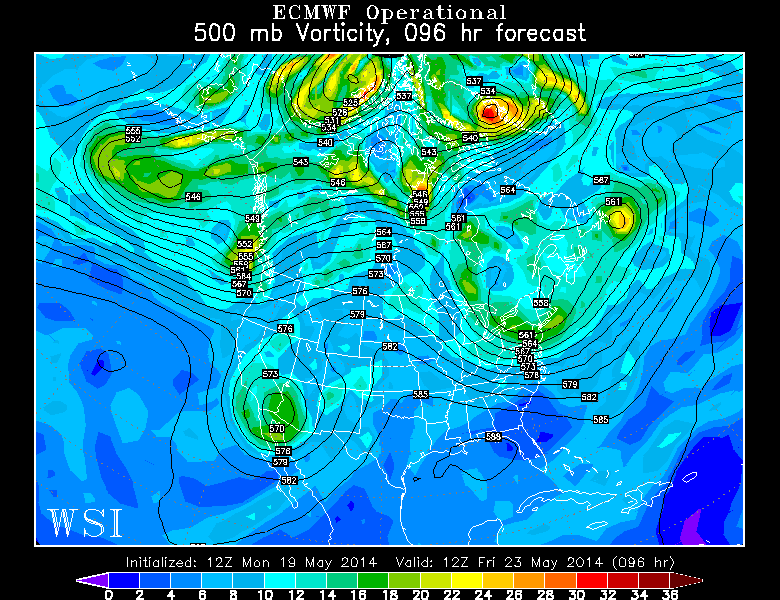 At least that’s what the GFS is showing. 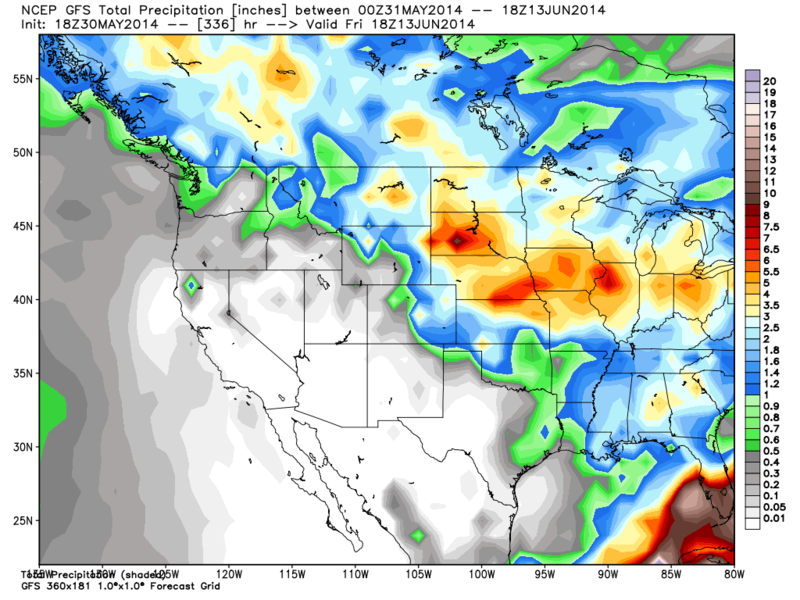 First chance for rain on that model is Sunday, and Monday too of course. 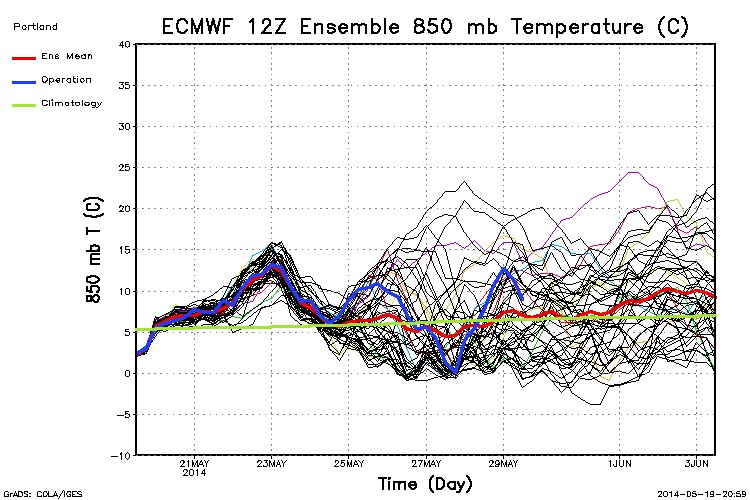 Here’s the 18z GFS model ensemble chart, showing the 20+ different ensemble members’ temperature at 5,000′. It shows pretty decent agreement on the cooling temps with the approaching trough. If this is correct, camping at those 4,000′ elevation mountain lakes will see high temps from from 50s Saturday to 40s Sunday and Monday…Brrr! Of course that would be a wet 40s! 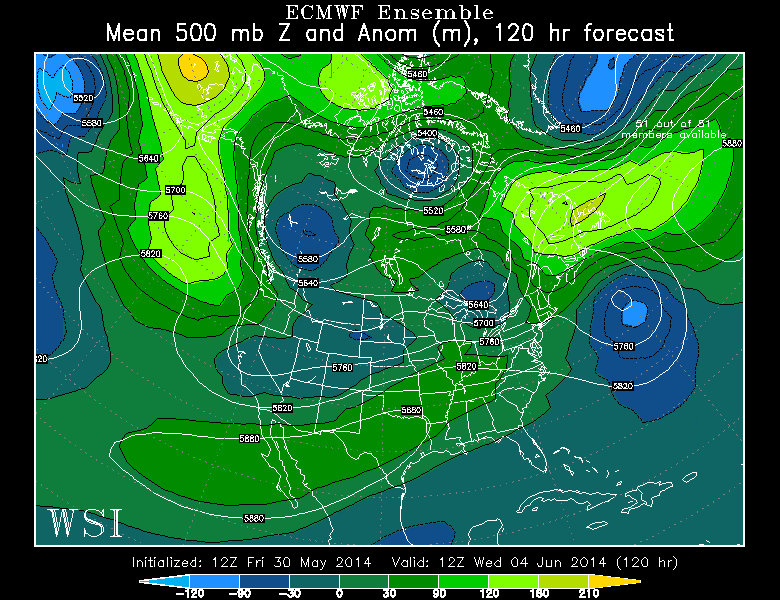 Then the Sunday chart showing the temporary ridging and 580dm heights. Wow, look at the spread suddenly developing starting on Saturday! 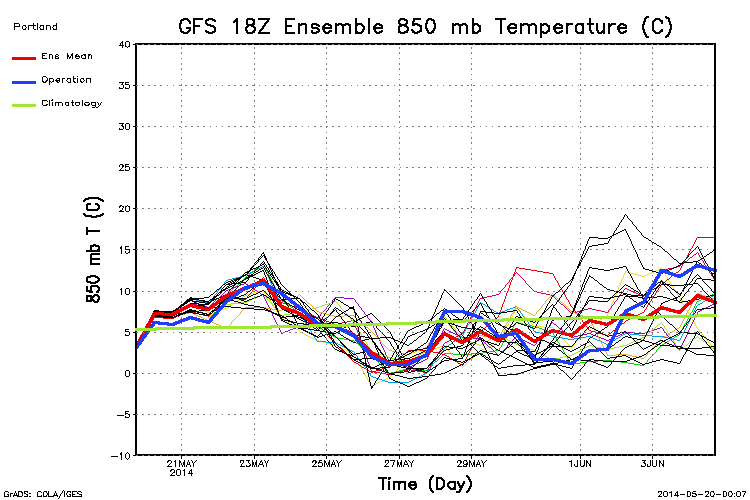 By Memorial Day itself, a good chunk of the ensemble members show 850mb temps around +1 to +6, the cool weather pattern the GFS is showing. But there are about a third of the members showing anything from +8 to +20! That’s why I say the weekend forecast is very uncertain. My gut feeling is that the slowly approaching trough is the best bet, more like the GFS. So our 7 Day forecast reflects that right now. By the way, I’m pretty confident it won’t be THIS bad during the upcoming weekend…remember these downpours? You can go back through the weather blog archives and check out details on each of these events over on the right side. More tomorrow when the forecast (I hope) becomes more clear…enjoy the sunshine during the week! 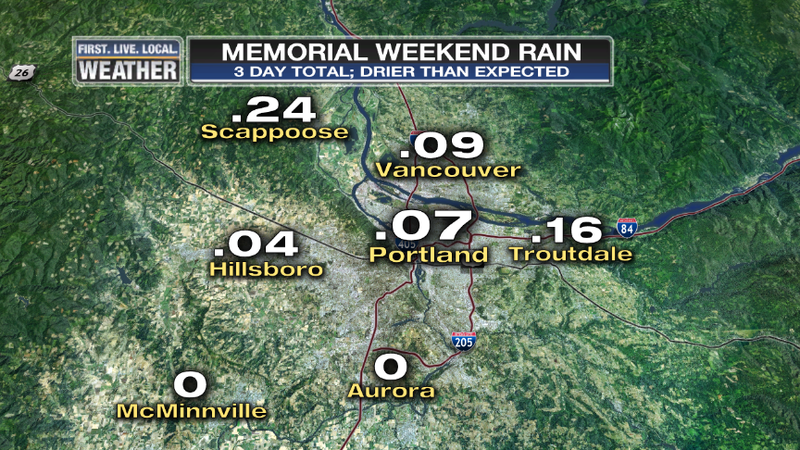 You are currently browsing the FOX 12 Weather Blog blog archives for May, 2014.